3M has long been a leader in environmental stewardship and commitment to customer–inspired innovation. It is this commitment that brought them to work with MiaSolé, due to our leadership position in the thin–film solar marketplace. 3M is the manufacturer of the barrier fi lm that is an integral part of the MiaSolé FLEX module, and they were very excited to be in the position to put the end result of their product into use on one of their buildings in Columbia, Missouri. 3M had some concerns about a solar installation on this existing facility. The building was constructed approximately 40 years ago, and was not designed to support the weight of a traditional rack–and–panel solar system. Another concern was the amount of wind resistance a solar system would provide, given the incidence of tornados in Missouri. A final consideration was the introduction of roof penetrations which could cause the roof of the facility to leak, damaging the expensive equipment located in the building. 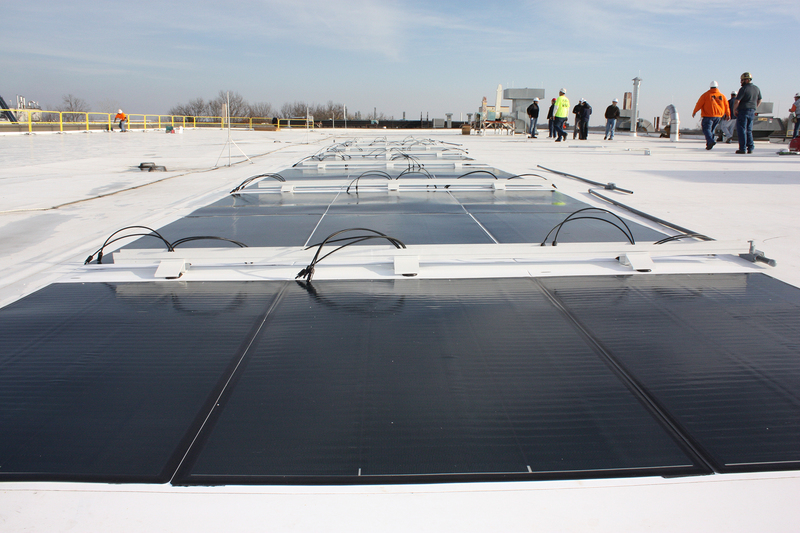 The flexible lightweight MiaSolé FLEX modules were the perfect solution for this facility. The rackless, low–weight panel did not require expensive retrofitting—the building could support both the solar system and the annual Missouri snow load. MiaSolé FLEX panels adhere directly to the roof, without the use of mechanical methods. This provides both excellent wind resistance and no increased risk of roof leakage, protecting the valuable equipment below. 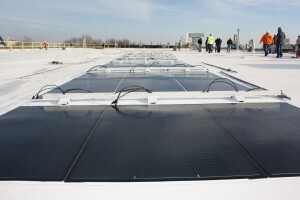 The MiaSolé panels were installed in record time. Even with the need to train a new team of installers, the entire 10KW solution was mounted in around two hours. Traditional rigid glass panel racking systems take 30-40% longer to install, due to complexity, size, and a high number of parts. According to Bill Moore, 3M Columbia plant manager, “MiaSolé has been a great partner in helping us establish a solar energy footprint. Their expertise helped us determine how to install a solar array on an older roof section and identify a qualified installer. The installation performs well and creates electricity each day that is essentially maintenance free.” Since the system has been operational, there have been no reports of problems due to wind damage or roof leakage. Best of all, using MiaSolé FLEX panels to generate renewable energy for their own building provided an opportunity for 3M to showcase their own product while helping them reach their goal to dramatically reduce their environmental footprint. “The MiaSolé solar energy project is an environmentally-friendly endeavor in which all of us at 3M Columbia can be proud and has connected us to our community as a further demonstration of 3M’s commitment to sustainability,” said Bill Moore. Without compromising their building’s integrity, 3M Corporation can make good on their corporate sustainability pledge, and make the world a greener place.